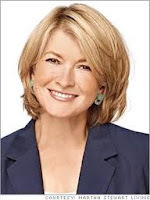 Hofstra Career Center: Martha Stewart and Linkedin...What?!?! As I was looking through my email today, I glanced at my daily newsletter from Linkedin. I noticed this really nice piece written by Martha Stewart, "Best Advice: You Can Do Anything You Choose". Not only did this piece seem fitting to share with you, but reminded me of all the amazing features of Linkedin. Many college students are already successfully using this site in their career searches but I know there are many of you wondering how to begin. And don't forget that you can research company pages, see job openings, and research how you are connected to employees!